The legendary French ethno-punk group performs for the first time in Romania and celebrates 30 years since their debut album. 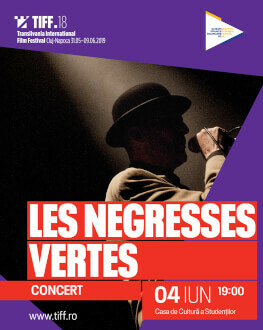 Les Négresses Vertes are one of the few rock bands to become an international success without playing in English, and yet selling millions of albums throughout the world. Born in the outskirts of Paris, their music is a novel mix of ethnic rhythms, flamenco, a punk attitude and rock influences. Their greatest hits, “Voila L’ete”, “Zobi La Mouche” or “Apres La Pluie”, have topped music charts for weeks, conquering audiences with their unparalleled energy. The band also played with household names like Massive Attack or Howie B. In 2018, Les Négresses Vertes reunited after an 18-year break and started a world tour to celebrate 30 years since their „Mlah” album. The tour includes the concert that will take place at the Transilvania International Film Festival (TIFF). The event is organised as part of the “Romania-France Season 2019” at TIFF.